Growing numbers of educators are using social media platforms to connect with other educators to form professional learning networks. These networks serve as alternative sources of professional development for teachers who seek to enrich their professional growth beyond school-based programs. This study aims to add to the small but growing body of research that explores how online teacher networks impact teachers’ professional growth. Informed by critical socio-cultural theory, the study closely examined the experiences of four social studies teachers participating in teacher networks on the social media platform Twitter. Participants offered rich insights into four key areas of professional growth: engaging with a supportive network, building confidence, reflecting on teaching, and changing current practice. Trust emerged as a key factor in facilitating teachers’ online engagement. In addition, teachers’ shifts in their practice tended toward more student-centered outcomes. Twitter proved to be a transformative experience of professional growth that generated meaningful changes to teachers’ instructional practice as well as how they thought about teaching and learning more broadly. Drawing on the understandings about learning and professional development gleaned from our study, we discuss the importance of teacher-driven professional learning opportunities for the educational community. Noble, A., McQuillan, P. & Littenberg-Tobias, J. (2016). “A Lifelong Classroom”: Social Studies Educators’ Engagement with Professional Learning Networks on Twitter. 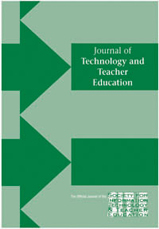 Journal of Technology and Teacher Education, 24 (2), 187-213. Waynesville, NC USA: Society for Information Technology & Teacher Education. Retrieved April 24, 2019 from https://www.learntechlib.org/primary/p/151754/. Wesley, P.M. (2013). Investigating the community of Practice of World language educators on twitter. Journal of Teacher Education, 64(4): 305-318.